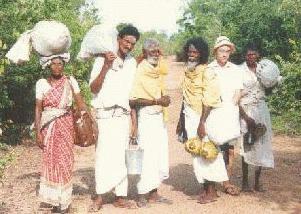 For most Sri Lankans, foot pilgrimage or Pada Yatra is a thing of the past. But to a new generation of participant-researchers who are quietly exploring the marvels of alternative Lanka, the Kataragama Pada Yatra tradition is a goldmine of vital clues concerning ancient underground wisdom traditions that authorities hope to tap for help in solving modern Lanka's vexing social and environmental problems. Even under the most adverse field conditions all along Sri Lanka's eastern coastal belt, young foreign scholars have been persevering in an exciting hands-on approach to Lankan culture that examines tradition from the inside out as it were through whole-hearted participation in the very traditions that have escaped the attention of conventional researchers. For fifteen-year old Theo Kruszewski, a model student from Michigan, USA, this meant putting books aside and coming to Sri Lanka for the school holidays to take part in advanced field research exercises that included walking in this year's Kataragama Pada Yatra. The daring experiment in educational research aims to prepare today's youth for survival in a fast-changing world yet to come. Theo had saved his own earnings as a part-time screen actor in the United States to come to Sri Lanka to take part in the three-month summer intensive program in educational adventure called 'Discover Lanka'. But just as he was arriving to Sri Lankan in May, heavy fighting in the North forced pilgrims to cancel their usual rendezvous near Mullaittivu forty-five days before the start of the sixteen-day Kataragama festival. Still, a few were determined to rendezvous elsewhere at a later time. Theo accepted this big disappointment, however, and even turned it to his advantage by using it as an opportunity to explore Sinhala village culture for some weeks in the company of the celebrated Vanni farmer and Sinhala folklorist Mudiyanse Tennekoon, thus learning a cardinal virtue of the Orient: patience. Later, other veteran researchers took turns in monitoring Theo's progress in plunging ever-deeper into the unfamiliar waters of Lankan mystery traditions. Despite its very serious objectives, Theo's three-month odyssey was also serious fun, an open-ended adventure that coincidentally placed him at the forefront of advanced research into the secrets of Sri Lanka's ancient alternative culture. But pain-staking investigative work was also part of it. "We already knew that ancient people all over the world said that Lanka or Serendib is a very special power center, a place where anything is possible, even an upside-down world all of its own", Theo explains. "Father Adam, gods Rama and Skanda, Gautama Buddha, al-Khadir, Sindbad the Sailor...they all had to come here for one reason or another. So that alternative world of Lanka must have been some very special important place." Theo speculates further: "Suppose the so-called 'underground world' of alternative Lanka really does exist as many people say it does. Just imagine what we could learn by communicating with that world, let alone actually visiting in some fashion or other. Wouldn't the real alternative Lanka be something fantastic to discover?" Pilgrimage or spiritual travel, as Theo learned, has been a favorite theme of poets and storytellers from ancient times right down to the present day. Mount Kailasa in distant Tibet, Trincomalee and Kataragama in the far south of Sri Lanka form a near-perfect analog to the axis mundi or sushumna nadi of yogic lore. Such unforgettable classics as Homer's original Odyssey about the twenty-year wanderings of hero Ulysses, Arabian tradition's Seven Fabulous Voyages of Sindbad the Sailor (who claims to have twice visited Serendib), Chaucer's splendidly earthy Canterbury Tales, Shakespeare's The Tempest, Lewis Carroll's Alice in Wonderland, and even American yarn-spinner Mark Twain's witty Adventures of Huckleberry Finn all point to a natural human fascination for other-worldly travel accounts. To young Theo, a cinema buff and occasional film actor, the prospect of doing fabulous underground explorations in tropical Sri Lanka had vivid cinematic associations as well. "Every so often it would cross my mind," he recalls, "that here I am on the other side of the world involved in some low-budget production of The Wizard of Oz, or in some offbeat Indiana Jones-type adventure, or worse. Only there's no script!" Improvising from day to day, Theo spent four weeks of his unusual vacation wondering if there would be any Kataragama Pada Yatra at all in 1991. On top of facing other difficulties, pilgrims and researchers could not walk as a party from Trinco to Kataragama until all the relevant paperwork was cleared with authorities in Colombo. 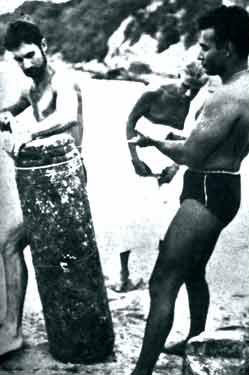 Theo took the opportunity to seek out and consult with leading local authorities on sacred geography including former deep-sea diver Mike Wilson who in the early 1960's had found and retrieved from Trincomalee Bay a large stone obelisk reckoned to be the long-lost svayambhu lingam that had once been Ravana's prized power object. Recounting mystical experiences that followed, Wilson explained to us how he and he former associate Arthur C. Clarke developed the concept that later became the science fiction classic 2001: A Space Odyssey. The former Mike Wilson, in his present incarnation as Swami Siva Kalki, now spends his days sunken in meditation. Emerging from one yogic trance state to another, Swami Siva Kalki seemed to recognize his young visitor's earnest cetana or intention. This researcher was also present as the wizened, bearded swami, still relaxed in his customary meditation posture, briefed Theo on the latest findings of ongoing research into legendary Lanka's invisible network of sacred power points. "We've come a long way since doing Space Odyssey", observed the lean saffron-clad visionary. "Now we know that the real odyssey takes place right here on planet Earth." "We know a few other things about it as well. Just take a map and see the near-perfect north-south alignment of major power points like Kataragama, Trincomalee, Mount Kailasa in Tibet and the North Pole. We know this 'accident' is no accident." "It seems to have something to do with Lord Ravana", the erudite sea explorer continued, referring to the legendary king of ancient Lanka. "God Siva Himself brought from Kailasa and presented to Ravana that same lingam that I later recovered from the bottom of Trincomalee Bay. But believe me, it is no ordinary stone. And now see how the same spirit of Ravana has been coming up in Kataragama of all places." Cautioning young Theo in measured words about the heavy responsibilities that may fall upon his shoulders, Swami Siva Kalki concluded by making guarded reference to a hypothetical world network of sacred power points that he compares to the mythical Indrajala or 'Net of Indra'. "We are talking about some very heavy-duty sacred power points and the channeling of terrific Shakti (subtle power) through them to points throughout the earth's biosphere. This is awesome work we are engaged in and a huge responsibility when you think of it." Meanwhile, thanks to the determined efforts of Kataragama Devotees Trust and local Pada Yatra society volunteers, word got around that the Pada Yatra would be commencing from Trincomalee in mid-June. Friendly Sri Lankan government officials conducted Theo and myself from Colombo by jeep to Trincomalee. There we were shown important local shrines including Koneswaram kovil where the mysterious lingam discovered under water by Swami Siva Kalki is once again on public display. From the heights of Swami Rock where King Ravana once reigned as Tiru Konesvara or 'Lord of the (Southern) Quarter', Theo and I could easily imagine how this might be a major power nexus in the north-south axis linking distant Mount Kailasa with Kataragama yet far to the south. As Lanka's living yogic tradition still has it, Kataragama the 'Southern Kailasa' is situated at the last point of solid ground before the chaotic void of the Southern Ocean that is identified with the realm of Yama, the mythical Judge of the Dead. The victorious youthful spirit of Kataragama, it is said, descends from high heaven down to earth or, analogously, comes down from Mount Kailasa in Western Tibet to Kataragama to face death here upon the battlefield of life and to rouse humanity from the death-like sleep of ignorance. It is a tale with profound implications. 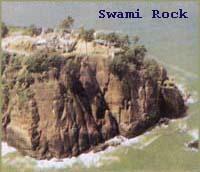 In fact, well-known local tradition maintains that Swami Rock is hollow with numerous hidden passageways that only mantravadins or magicians know how to open with the proper 'Open Sesame' mantra. Together Theo and I went close to the towering rock's sheer face with the waters of Trincomalee Bay far below us, but we could see not detect of any fabulous doorways. Our walking course in sacred geography, however, had just begun.  Over the centuries from time immemorial, countless swamis, bawas and others have taken part in this same mysterious descent of the spirit from the far North to Lanka's far south. 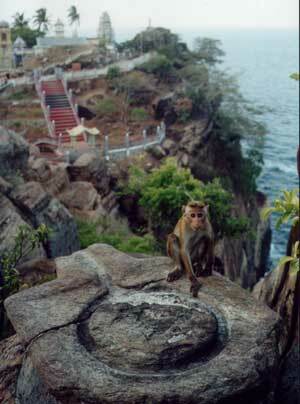 From all over Sri Lanka and India they have come, and even from as far as Central Asia. 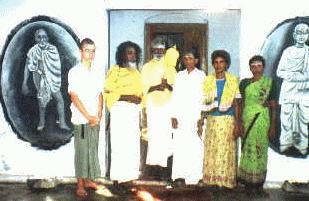 Then as now, Kataragama was considered to be a center for higher initiation into sacred Gnostic mysteries. Among those who received the 'call' were Palkudi Bawa and Yogaswami of Nallur. Local tradition maintains that Kataragama's mystery schools have all gone underground where their arcane wisdom is still preserved. Details are scarce, however, for veil upon veil of secrecy surrounds Kataragama and all that goes on there to this day. And yet, working with the wealth of structural evidence laying before us, researchers like Theo and myself are gathering scattered clues to the immense enigma of Kataragama. Even now, we are still turning over the scrambled pieces of a vast, religious-scientific puzzle to see how it all fits together. Confronted with the immensity of our research, Theo opted to go a step further by having his head shaved as so many pilgrims before him have done. 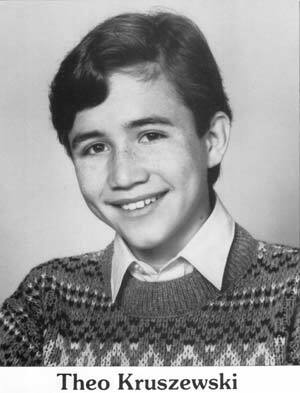 For the shy yet handsome American teenager, the move signaled a readiness to abandon his cherished self-identity and to take the big leap that could hurl him out of the humdrum world of conventional reality and into a subtle realm where infinite possibilities loom before the eye of the accomplished seer who is free of personal attachments. "I looked at it like this," recalls Theo. "If I am going to come all this way to make a statement about who I am, then I might as well go all the way. Otherwise, what's the point?" "Besides, I had heard that people who go to Kataragama often make a vow or promise to the spirit of the place. To get something, they have to give something smaller in return. It's a kind of deal. The only way to find out if it works is by trying." Now ready for the real thing, Theo and I put on pilgrims' dress and went looking for the other pilgrims. One by one we found our friends, the simple village devotees who call themselves the cinna alkal or 'little people'. But only a few could be found. 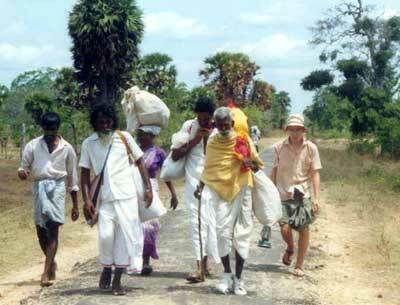 In previous years, hundreds of devotees from villages as far north as Jaffna used to walk annually to Kataragama. Each party or kuttam of up to fifty pilgrims would not only walk together but also worship together and camp together by night. Each kuttam often had its own name and distinct personality as well. This year, by contrast, there would be only one small party of pilgrims, the Vel Kuttam. 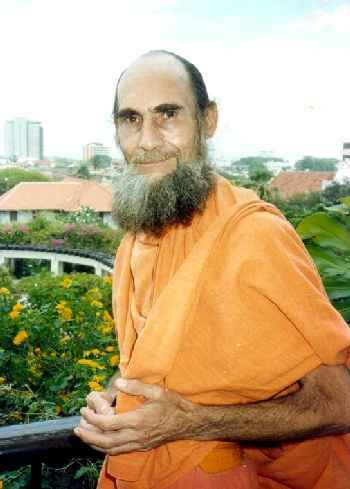 The previous Vel Swami, Muttukumar who had led the Vel Kuttam since the 1950's was now too old for Pada Yatra. But he had given his blessings along with his gleaming lance-emblem to a spry old swami, Sellaswami, who was still fit enough to endure the rigors of Pada Yatra. Sellaswami's niece from Mannar would accompany him as an attendant, while bilingual Siva Sandri Swami would serve as the new Vel Swami's administrative assistant. 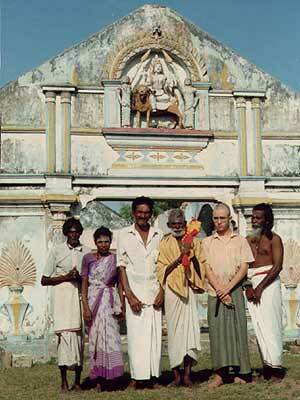 Two other experienced Tamil swamis, plus Theo and myself: that made a skeleton party of only seven 'little people' prepared to walk from Trincomalee to Kataragama in 1991. But other pilgrims might be expected to join our little party along the way. With the rousing chorus of 'Haro-Hara' (hallelujah), the Vel Kuttam set out from Trincomalee Kandaswami kovil one morning at dawn to the astonishment and delight of cheering witnesses. Marching straight to the jetty, we boarded the motor launch that would take us across the bay to Mutur an hour or so away. Like a small amphibious landing party in wargod Skanda's army, we were ready to hit the beach and advance through all manners of uncertainty to our distant objective - Kataragama. This article first appeared in The Sunday Island (Colombo) of 6 October 1991. 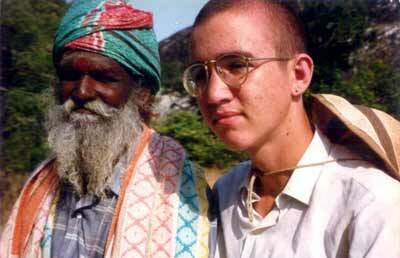 Theo's summer in Sri Lanka was sponsored by the Kataragama Devotees Trust and Cultural Survival of Sri Lanka. Visit Theo Kruszewski's own website www.bingregory.com.